The average person spends about 13 hours every week sorting through email. If you want to cut through the noise (78% of us receive up to 100 emails per day) and make your emails stand out from the crowd, start using these 15 techniques. Some people have a lot of email sitting in their inboxes. For example, the senior director of Yahoo! email claims to have held 36,815 emails in his inbox at one point. If your subject line looks like "Re:Re:Re:Fw:Fw:Re:Re…," it is very likely to be ignored. On the other hand, if your email is actionable, it has a better chance of catching the attention of the recipient. Don't write "Steve," write "Call Steve at 555-987-1234 this Friday." Instead of "Resume," write "Davila Resume for Freelance Writer Position." Remember to keep it short and sweet. From a study of 200 million emails, researchers at Mailchimp found that subject lines should be kept to 50 characters or less. That's about ⅓ of the length of a tweet. FYI — "For Your Information" lets the reader know that the email holds general info and is not urgent. EOM — "End of Message" informs the reader that all the required info is in the subject line and that the email body is empty. 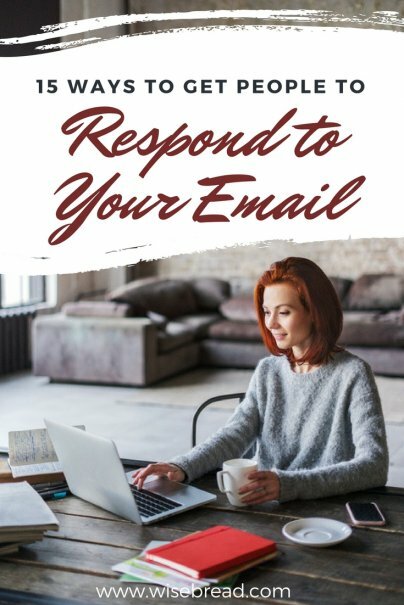 NRN — "No Reply Needed" tells the receiver that no response is required. URGENT — Not necessarily a prefix, but if something is truly urgent, then it should be at the beginning of the subject line. Use very sparingly or risk all of your "urgent" emails being ignored. NFA — "No Further Action" is a combo of FYI and NRN. Nobody likes to be caught in a neverending email duel. So, the next time that you need to set up a meeting or call time, include the statement "If not, let me know what times work for you." Get in the habit of including "if… then" statements every time that you ask a question to prevent replies that are just "no" and force you to send another email. Take a cue from master email negotiator, Steve Jobs (yes, that Steve Jobs! ), and include a list of numbered choices, when applicable. During a hard-nosed negotiation via email between Apple and News Corp, he clearly stated to his counterpart that he "has the following choices" and that "Maybe I'm missing something, but I don't see any other alternatives. Do you?" This email habit allows you to negotiate within a range of pre-approved terms and forces the other party to choose one. If you are an HTML whiz and love to tweak your emails, remember that 43% of email is opened on a mobile device. Email company Constant Contact recommends using a San Serif font with a point size from 11 to 14. Several email providers and platforms automatically block images or force images to be attachments. This means that your fancy signature image goes unnoticed or, even worse, screws up the format of your email. Not all emoticons, especially the very obscure, render the same way across platforms. Even the smiley symbol often appears as a J in several email platforms. Skip the emoticons altogether, so that you don't confuse your recipient or make her think that you are including typos in your emails. Plenty of people, including Microsoft employees, are annoyed by this. Just because it is the Internet, it doesn't mean it all should be all LOL and TWSS. Studies show that only 16% of us read things word by word on the web. This means that if "you is not doing it good, the grammar," you're adding unneeded difficulty and your readers may skip your email altogether. If it is urgent, the onus is on you to pick up the phone, not the other way around. A Wharton professor of management and psychology indicates that this may make you look rude. He recommends to let the other person suggest some times. If you need to reach the other person immediately, then move away from the computer and pick up the phone. As a Hawaii resident (that's -3 hours PST and -6 hours EST during daylight saving time), I cannot stress how important this point is. If you need a same-day reply by 10 a.m. EST, it would be a good idea to have sent your email at least the day before. Unless you're writing me a tax-free check for $1 million, it is highly unlikely that I will wake up at 4 a.m. just to reply to your email. Use a time zone converter or Google to calculate time zone differences. Skip any of these awful email vacation auto responders and keep it as simple as possible. Include the start and end dates of your vacation, and the name and phone number/email of an emergency contact. Self explanatory! This bad habit gets annoying very fast! Or indicates an obsession with factorials! You be the judge of that! Images do speak louder than a thousand words. Unless they are 2MB and require you to go "up, up, down, down, left, right, left, right" to view them. Also, large image files increase the chance of your email being caught by a spam filter. If your email open with "Hey" or "Hi" and without a name, it is most likely to be flagged as spam or upset somebody that you don't remember their name. You need to address an email recipient by his or her name and on a one-on-one basis. If you send an email to a long list of people and request "somebody" to help you with your project, the only person answering is going to be "nobody." If you truly need to send the same message to several people, opt for individuals emails with a personalized message. You will increase the chances of people responding to you, which is what you need. Additionally, it prevents the number one sin in email writing: The abuse of the Reply All button. Busy, successful people pride themselves in achieving Inbox Zero. For example, author and entrepreneur Guy Kawasaki, deletes emails after 21 days because he assumes that if it's truly important, the other person would follow up. So, follow up! What is your top piece of advice to use email more efficiently at work?